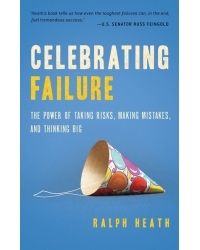 Celebrating Failure is the definitive how-to manual for leaders seeking to embrace the power of failure as a learning tool to improve their organizations and achieve ever-greater goals. The business world (and, lately, the political arena) is convinced that the number one topic is change. Heath posits that it might well be failure, because if you do it right, failure can become a launching pad for change. •Engaging stories of real-life business and personal failure experiences. •Practical steps to apply each chapter’s “lessons” and change your approach to risk-taking and failure. •Positive, effective ways to eliminate the “fear of failure” that can hold you back in today’s competitive, fast-changing world. Heath’s insightful stories lay out his own failures and reveal his human side as a son, father, athlete, and business leader. Ralph Heath is president of Ovation Marketing, an ad agency he founded in 1978 in La Crosse, Wisconsin. Ovation was twice named to INC magazine’s 500 fastest-growing companies. Heath is a John Caples advertising award winner and was recognized as Midwest Direct Marketer of the Year. He is a motivational speaker and has taught advertising at the University of Wisconsin. He is president of two nonprofit organizations, Mississippi Valley Conservancy and Human Powered Trails. Heath has been honored as a four-time Triathlon All-American, and is a two-time finisher of the Hawaii Ironman and a 2008 bronze medalist in Wisconsin cycling.